The days are getting longer and spring fever is setting in...why not visit the Outer Banks? Spring is quickly approaching! Why not take an early vacation and relax on the unspoiled beaches of the Outer Banks! 1. Spring offers off-season rental rates! Reserve an OBX vacation rental for a fraction of its cost! 2. Our beautiful beaches! The temperature is on the rise, making spring a great time to enjoy surfing, kayaking, windsurfing, collecting shells and beach glass, or just playing in the sand before the crowds set in. 3. Everything is waking up from the winter. Shops, restaurants and other businesses are opening (with great off season prices!) 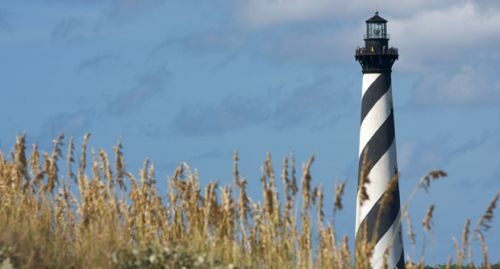 and fantastic local attractions like lighthouses, museums, local marathons along the shores, and the Outer Banks Taste of the Beach also begin their seasons in the spring. 4. Cool nights are perfect for evening strolls and beach bonfires. The average day-time high is in the upper 60s during the spring but nights can be chilly so it makes for a great time to sit around and catch up! 5. Many will tell you that Outer Banks fishing is better in the spring. From March-May, some of the best surf fishing can be found on the shores of the OBX. And offshore fishermen find May-June better for large tuna, mackerel, wahoo and dolphin catches. 6. The Outer Banks in the spring hosts a number of annual events, everything from music festivals and marathons to bike rallies and food festivals. 7. May flowers aren't the only thing brought on by April showers. Rain storms wash interesting finds up on the beach. Everything from whole shells and sea glass, to pieces of shipwrecks can be found on the beach in the spring; and since it isn't so crowded, you don't have to be the first one up to discover them! 8. The beaches aren't the only thing less crowded, there is far less traffic on the Outer Banks during the spring, making your drive here and around the islands much more enjoyable! 9. Local cultural events - like history storytelling - only take place every spring. So pack light and listen to the stories of how the Outer Banks came to be. 10. Few things are more enjoyable to a dog, than a good game of fetch. During the spring, leash laws are more relaxed so you and your pet can enjoy more of the beach together!